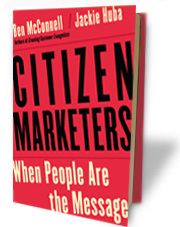 We're really excited about this month's TypePad Book, Citizen Marketers by Ben McConnell and Jackie Huba. We've already featured their excellent TypePad blog, Church of the Customer, where the Chicago duo dispense marketing wisdom to thousands of savvy subscribers and casual readers. That's why we were expecting a solid hit from the team's second book, following up on 2002’s Creating Customer Evangelists. That said, we think Citizen Marketers, a narrative look at how social media is changing the way individuals and companies interact, is pretty much a home run. That's why we decided to not only make Marketers the January Book of the Month, but offer a 10% discount and a free copy of the book to new TypePad Pro-level annual subscribers. If you know someone who is ready to move from having a web site to having an influence, point them to this promotion where they'll get the tools they need to make an impact, and also learn about the motivation and methods of the online influencers that McConnell and Huba discovered during their research. If you want to get a taste of the duo's deep knowledge about the intersection of networked media and marketing strategy, just listen to the TypePad Books podcast, which features McConnell and Huba in conversation with our own evangelist, Anil Dash. We think you'll find some great takeaways, no matter where along the business blogging spectrum you fall. We particularly enjoyed the authors' take on blogging software: "Whenever we talk to people about blogging, we always point them to TypePad because it has the best systems, we think, for the different levels of engagement that people need for blogging. Whether they're a beginner or they need industrial-strength tools for working towards a large crowd." 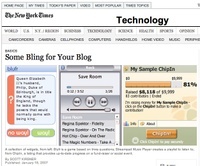 The nice people at the New York Times have just posted Some Bling for your Blog, a look at Widgets for blogging. And hey -- "Bling For Your Blog" is the tagline we used to talk about TypePad Widgets when they first launched! Cool. TypePad members are all over the story. Whether it's Pastor Hyatt or A VC or Guy Kawasaki, a lot of the coolest widgets are being shown off on TypePad. There's even a nice mention of Widgetbox, which powers hundreds of additional widgets for our Widget Gallery. And that's one of the best things about TypePad widgets -- they just work. From Weather reports to web search, blufr to Bunchball to Bitty, you can put any of these bits of bling on your blog. Sometimes bloggers who switch to TypePad worry about whether a widget will work on their blog or not. (On other tools, 90% of the widgets that are listed on a website don't work.) But don't sweat it: all of the TypePad widgets listed in the gallery can work on your TypePad blog today. Go add some bling to your blog! Bloggers are getting book deals right and left. 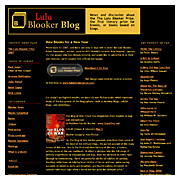 Lulu, a prominent figure in the self-publishing industry has sponsored a new award -- The Lulu Blooker Prize. And the Lulu Blooker Blog discusses all things about this annual contest for books that have sprout from blogs. Zane Safrit is in the business of creating customer evangelists. He is the CEO of Conference Calls Unlimited, a company dedicated to offering simple and affordable ways to conference. Zane's blog is an outlet where he shares his wisdom on the Web 2.0 world, as well as cool stuff that crosses his browser. Do you know the difference between Samba and Salsa? Professional photographer and dance enthusiast Marcy Mendelson is building a global community for lovers of dance, culture, and music. 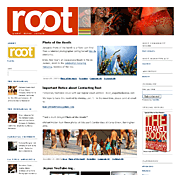 Root Magazine educates its readers on dance while pointing to all kinds of world beats from Bhangra to Tango. And even though it wasn't on "Featured" this week, we also want to point out a great collaborative blog that our friends at Palm put together to cover the Consumer Electronics Show in Las Vegas this week. The CES 2007 Micro Blog invited anyone with a Treo to register with Palm as a guest author on the Micro Blog. Contributors then used TypePad Mobile for the Palm to post photos and updates from the show. It's a great (and entertaning) record of conference life in Vegas. Are you interested in seeing your blog in lights (where "lights" means "14px bold Arial")? We're always on the lookout for great sites, as well as feedback on why you love doing what you do with your blog. So let us know! Update 11:10 pm: we completed our maintenance activities on TypePad without incident. Thanks for your patience, and you may now resume blogging! Just a reminder: tonight, Friday January 12th, starting at 9:00 pm PST (that's 05:00 UTC on Jan 13), we'll be taking TypePad offline for approximately two hours to perform routine maintenance. During this time, the TypePad service, all TypePad blogs and the TypeKey authentication service will be unavailable. We'll be keeping status.sixapart.com up to date during the maintenance window, so if you're interested you can tune in there for updates. Last night we launched some new features on TypePad that we're excited about, and want to make sure you know about them. First, we introduced eight new themes; four color variations each on "Hills" and "Curves." "Hills" is one of the most popular design sets from Vox, so we went ahead and "borrowed" it for TypePad users. (And we'll be doing more theme "borrowing" over the next couple of months, so stay tuned.) Curves is a new theme that's exclusive for TypePad users, and we think it has a nice professional look to it. Second, if you're using one of TypePad's built-in templates, you'll notice that your entry titles are now linked to the permalink of the post. This makes it easier for readers to navigate to your individual entries. (Those hyperlinks will start to appear as your blog is republished, which can happen when someone comments, when you create a new post, or if you choose to republish from the Design tab.) There's some minor tweaks to the CSS for blogs to make the change seamless from a design perspective, too. If things look a little bit off on your blog, just do a hard refresh in your browser (hold down the Shift key when you click reload) you should get the updated stylesheet and all will be right with the world. Third, now you can add page headers to your date-based and category archives. If you get readers who come in from Google and wonder where they heck they are, now they'll know where they are -- your archive page will have a message saying that the page has "26 entries from January 2007," for example. You can see this in action here on Everything TypePad, just click on over to our Features category page to check it out. Let us know what you think -- more features are on the way and the TypePad team's working hard to keep improving the service. This Friday evening, January 12th, starting at 9:00 pm PST (that's 05:00 UTC on Jan 13), we'll be taking TypePad offline for approximately two hours to perform routine maintenance. During this time, the TypePad service, all TypePad blogs and the TypeKey authentication service will be unavailable. As always, we'll be keeping status.sixapart.com up to date with the latest information, so bookmark that site if you're interested in following along. Thanks for your patience as we continue to invest in making TypePad bigger, faster and stronger! The interview is available as an MP3 on Debbie's site, and you can subscribe to her podcast to get future editions of the show. To celebrate the new year, we're happy to announce that a new batch of Widgets have been recently added to the TypePad Widget Gallery. 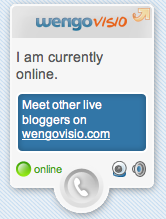 WengoVisio is a live audio & video widget from Wengo.com. It allows your readers to connect with you through one-click audio and video calling, without requiring a download or subscription fees for the caller. Yedda is a new site where you can connect and learn from a community of people who know the answers to your questions. Yedda has created a suite of Widgets for TypePad: the Ask Me widget, the FAQ widget and a user profile Widget. Raising money for a good cause, your small business...or for a weekend getaway? ChipIn is a new service that simplifies the process of collecting money from groups of people. 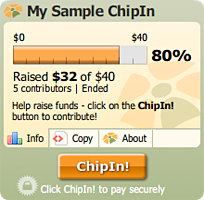 The ChipIn Widget is a simple, great-looking Flash application that lets you keep people up-to-date on your fundraising efforts. NewsCloud is an open community website for sharing, rating and commenting on the news. The NewsCloud Headlines widget lets you share popular feeds and top headlines from NewsCloud on your blog. If you haven't browsed the gallery lately, you should take a look. We're closing in on 100 Widgets that have been built especially for TypePad bloggers; they're an easy way to add content and functionality to your blog and enhance the experience for your readers. And if you're interested in developing Widgets, we'd love to have you. The API is easy, open and publicly available. Learn more at our Widget Developer Center.